THE PARROT AND THE PARSON. Written by Frank Archer. Arranged by Peter Conroy. The cookie was a maiden fair, with quite a modest look. The mistress for a trip had gone to Long Branch for the day. The parson kissed the cookie as he took her on his knee. The parrot hanging in the cage his- capers there could see. The cookie found a pot of jam and placed it in the cage. To draw the bird's attention while in kissing they'd engage. The parrot in the cage was in a dreadful rage. The parson had the cookie on his knee. Each other they did chaff, which made the parson laugh. The parrot shouted, "What a jolly spree!" He said, You are my darling little lamb;"
She kissed him once or twice, said the parson, "This is nice,"
And the parrot shouted, "Jam, jam-jam, the jam!" Now the very artful parrot for their courting did not care. 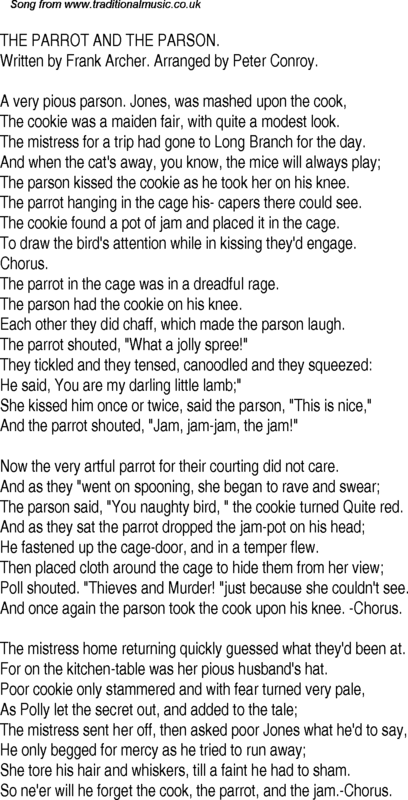 The parson said, "You naughty bird, " the cookie turned Quite red. He fastened up the cage-door, and in a temper flew. Poll shouted. "Thieves and Murder! "just because she couldn't see. And once again the parson took the cook upon his knee. -Chorus. The mistress home returning quickly guessed what they'd been at. For on the kitchen-table was her pious husband's hat. She tore his hair and whiskers, till a faint he had to sham. So ne'er will he forget the cook, the parrot, and the jam.-Chorus.